When reading PDF files, sometimes we need to add notes to the files for ourselves or for the reader. As we know, it is not easy to edit PDF files, let alone adding notes to PDF. Don't be upset. 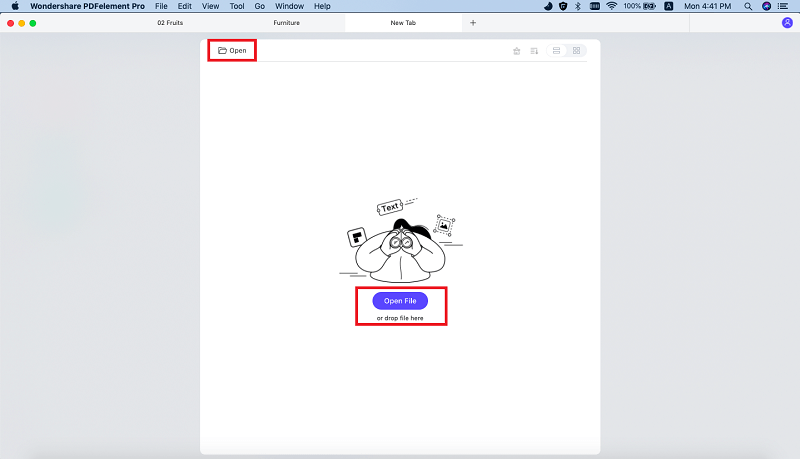 In this article, we will share the easiest way on how to add notes to a PDF file on Mac (macOS 10.13 High Sierra included), using PDFelement Pro. Mac OS provides a built in function for standard annotations however, it cannot provide everything that is above basic. This can be a huge inconvenience to many Mac users. With an effective program like PDFelement ProPDFelement Pro, you can annotate and mark PDF pages easily. It comes with sticky notes, drawing tools, text box, mark up tools, and so much more. 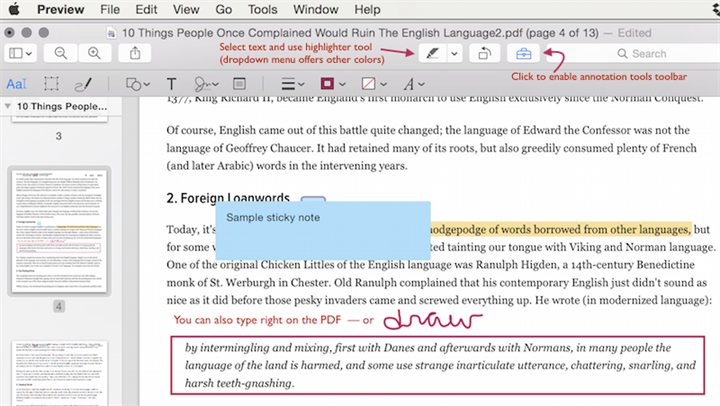 Add notes to a PDF on Mac with this software and your text analyses will be more productive. 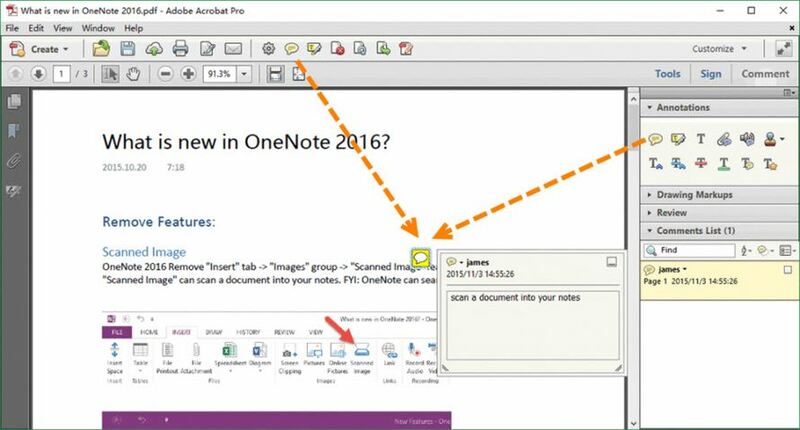 From a dropdown menu on the Tools option, you can access and even customize any of these note taking tools. It provides you many PDF editing tool to edit, convert, create, secure, OCR and share PDF files. You can batch process multiple PDF files and do data extraction from PDF files. The first thing you need to do is to launch the PDFelement Pro after successful installation. Then click the "Open File" button to add the target PDF to the program. When the file is filly loaded, you can then proceed with note taking. Drawing Lines - You can add imprints on your selected pages and you can also draw lines on them. Add links - You can open the "Edit" menu and click on the "Links" button. And then you can add links or URLs on PDF pages. Free Hand Drawing - Another way of adding note to PDF Mac is by free hand drawing. If you find it better to see your hand writing in your notes then using this tool is ideal. Click the "Pencil" button on the toolbar under the "Comment" tab to activate this feature. You can always erase it with the eraser tool if you ever you make mistakes. Markups - this is ideal for highlighting some parts of the page. Just click on the "Highlight" button. Highlighter color can also be changed to different color options. The tool under "Comment" tab can also allow you to underline or cross out desired sentences. Document mark ups are essential for marking content. These are some of the simple ways on how to add notes to PDF on Mac using PDFelement Pro for Mac. If you want to discover other note taking and documenting features you can try it with the software. Note taking and adding comments and annotations can be more interesting with a program that is easy to manipulate and control. The process is too simple and therefore it requires no additional installation as the Mac viewer has it all. The steps to be followed are explained as under. Step 1. Open the markup toolbar: Once the document is opened in Mac preview click the Mark up Toolbar option. The toolbox icon on the top is the one to be clicked. Step 2. Click on the Note icon: Click the note icon once the toolbar appears. The note always appears in the center of the document. The best part is that it can be made as long as required. The space of the note adjusts to fit in all the text. Once the typing has been done click anywhere on the document outside the note area to finish the addition. Adobe acrobat reader also comes for Mac which is a very handy tool. It can also be regarded as one of the easiest methods to add notes to PDF files. Another great part of the program is its interface which is user friendly. It is a two-step process and requires no additional steps to be followed. Once the acrobat reader has been downloaded and installed the file is to be imported to it. The sticky note icon on the top is then to be pressed. The notes area will appear on the document which can be used to add notes. Once it has been done click anywhere outside the note area to complete the process. The post button can also be pressed as an alternative.